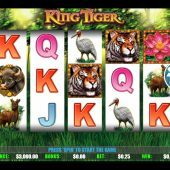 A journey into the heart of the jungle greets players willing to take on King Tiger slot from Nextgen Gaming. This one is all about the big orange cat, which prowls the grass lands and tree lines in search of prey. King Tiger offers 5 reels, over 3 rows and 20 paylines in total. 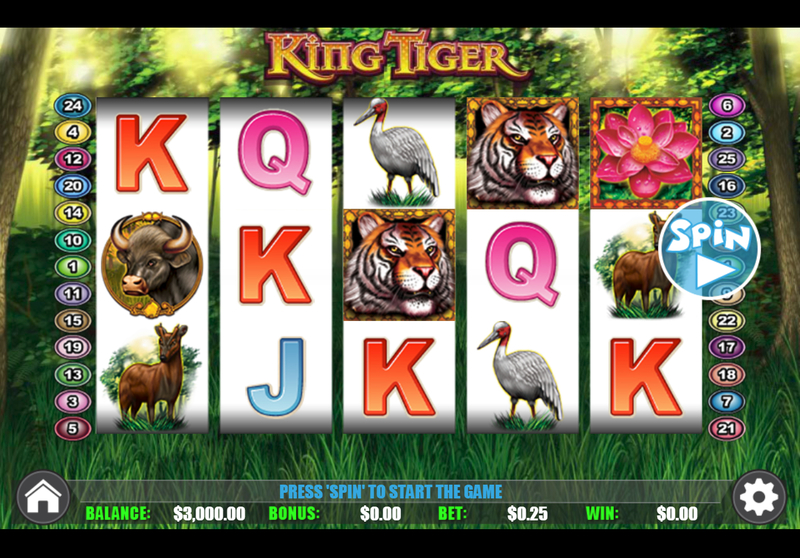 The game is not complicated, offering a very straight forward slot game experience with sounds and sights of the wild. Animals represent the highest value symbols in this game, including the elephant, buffalo, deer and flightless bird. Lower paying symbols include A, K, Q, J, 10. The tiger symbol is Wild and appears on the middle 3 reels only. The Tiger Wild can be stacked, offering extra winning potential. The only other symbol is the pink flower scatter, which play's its part in the bonus feature. King Tiger has a free spins feature, which is triggered by landing 3 or more pink flower scatters. You will initially be awarded 10 free spins and all wins will pick up a 3x multiplier during the feature. The bonus games can be retriggered by landing 3 or more scatters in the same spin during the feature. There is nothing new here in King tiger slot, so it is more likely that the theme will draw you into the jungle, rather than anything new or innovative with the game. If you like big orange cats in your slots then you may like to check out Tiger's Claw and Untamed Bengal Tiger, both of which offer something very similar.